Don’t be left behind in the biggest marketing trend. “Content Marketing” has been one of those buzzwords in the marketing community for a while now – but it’s no longer just something talked about, it’s becoming the way of marketing. Consumers will do research on their own and need information before they’re willing to reach out to you – so you need to provide this content to them in order to win their business. It is the “new” way of marketing. And according to recent statistics, it seems like we are already well on our way to this statement becoming true. 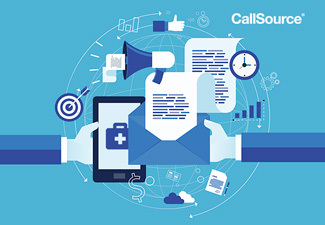 Almost 83% of healthcare organizations use content marketing, according to a recent research study from True North Custom and Healthcare Insight. The report is based on data from a 2017 Q4 study conducted among 53 healthcare marketing professionals such as market leaders like Cleveland Clinic, Johns Hopkins, and many more healthcare organizations. Read on for what we found to be some of the most interesting facts for you to know from this report. Content marketing is becoming increasingly important and utilized in healthcare organizations. In 2017, about 83% of healthcare professionals said their organization uses content marketing (compared to 69% the year before). 14% said they plan to employ content marketing this year – which means only 3% are left not using content marketing with no plans to start. 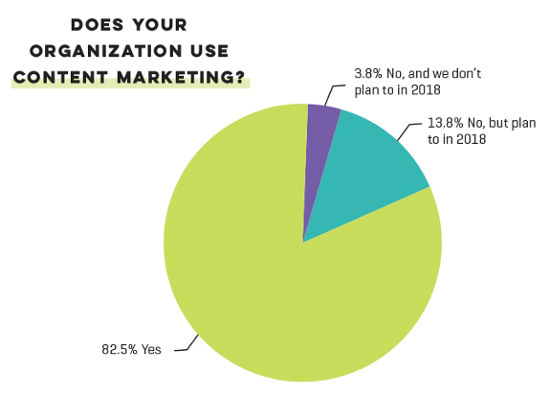 Close to 100% of survey respondents said that content marketing is a high or medium priority when compared to other marketing and communication initiatives. 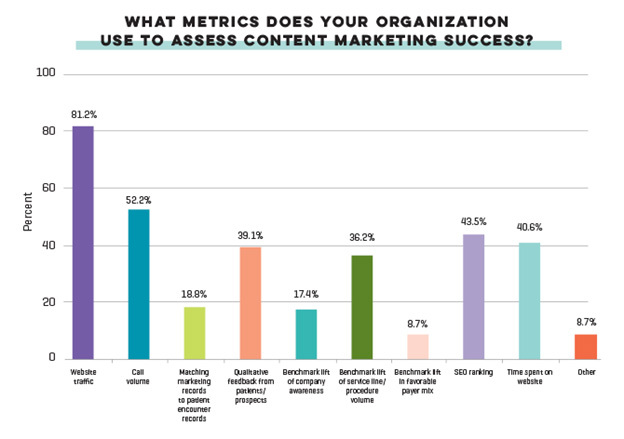 A few content marketing goals and ways of measuring effectiveness stand out amongst the others. A content strategy cannot be fully in place without having some goals in mind. Top goals for content marketing this past year are for brand awareness, patient loyalty, engagement, and lead generation. 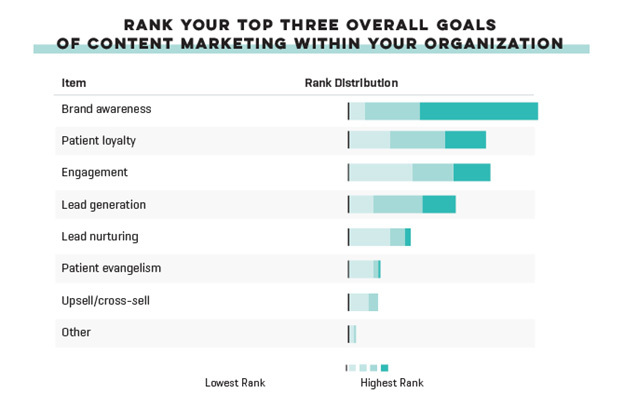 With goals set, how do you determine success in your content marketing? The metrics most used by other healthcare professionals are website traffic, call volume, and SEO ranking, followed closely by time spent on website. Interested in adding call tracking to your business to know your true call volume by ad source? Ways of distributing content are somewhat the same as last year – but still evolving. 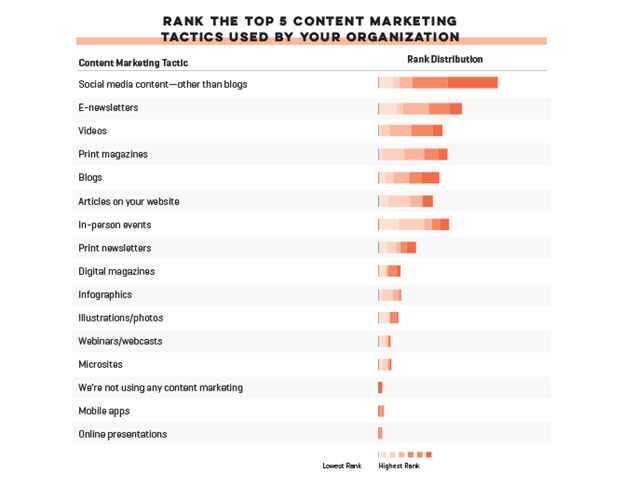 Four of the top five content marketing tactics are digital, with social media content far above the rest, followed by e-newsletters, videos, and blogs. Makes sense, right? The majority of consumers are coming online to digest content. Yet, print magazines round out the top five—and actually rose to #4 this time around after coming in at #7 among content marketing tactics in last year’s study. Video is an up-and-coming way of distributing content – expect to see it more and more in future on social channels and websites. 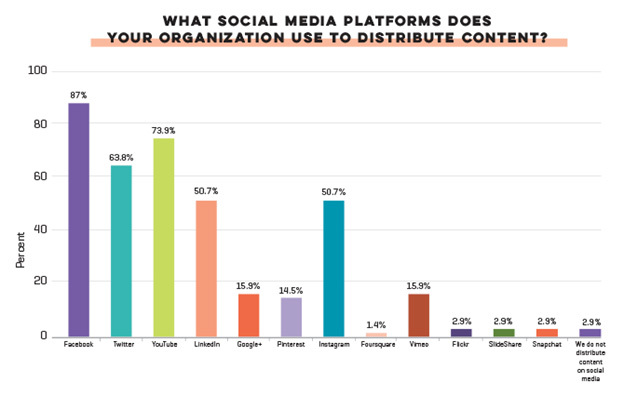 Facebook still reigns supreme at 87% when it comes to the social media platforms distributing content, followed by YouTube at 74% and Twitter at 64%. 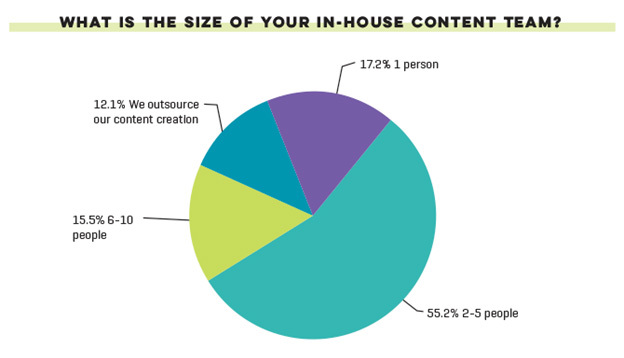 Content marketing budgets are increasing. Budgets allocated for content marketing purposes have risen by 25% from last year, and are expected to keep increasing, yet the size of content marketing teams have stayed about the same with around 2-5 people. Bottom Line: It’s time to start implementing content marketing in your healthcare organization (if you aren’t already). Gone are the days of strictly word-of-mouth referrals or gaining business simply because your office falls within someone’s insurance plan or you are located conveniently close by. Patients are looking at other resources and gaining knowledge in more areas to make their decision on who to choose for their hearing specialist, dentist, or other healthcare need.